Recently I noticed that I uploaded more then 1000 files to Silhouette Design Store. Some files contain several designs, so this number is even bigger. I guess it's a great occasion to make a giveaway. 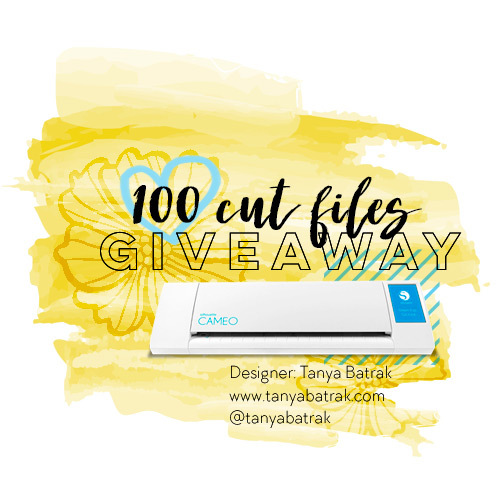 1) 100 cut files (for your choice from all my designs uploaded to Silhouette Design Store) - for a person chosen among Inlinkz links here in this post (see below). 2) 10 cut files (for your choice from all my designs uploaded to Silhouette Design Store) - for 2 persons chosen among Inlinkz links here in this post (see below). - Make a repost to any of your social media accounts (Facebook, Twitter etc.) using the picture above and the link to this post. DO NOT add your links from Instagram, it has it's own giveaway (see below). Thank you! - And/or add the picture with the link to this post to your blog sidebar. - Let's limit the links to 3 per person. 1) 100 cut files (for your choice from all my designs uploaded to Silhouette Design Store) - for an account chosen among the reposts on Instagram. 2) 10 cut files (for your choice from all my designs uploaded to Silhouette Design Store) - for 2 account chosen among the reposts on Instagram. - Make a repost of the giveaway picture. You don't need to copy all the text with rules and prizes. • I giveaway only my own designs. I do not giveaway any of the Silhouette machines or supplies. • If any of the links or reposts are invalid I will choose another winner. • If the winner doesn't claim his/her prize within 5 days I will choose another winner. • All cut files are for PERSONAL USE only! Thank you! • I will add the separate post with the winners here on blog and on my Instagram account on the 9th of February. • I will provide the download link for each winner.